Most people will tell you that being laid off can be one of the most traumatic things to happen in our lives. Our means of providing for ourselves, our family, our way of life is pulled out from under us in one fell swoop. We're usually left feeling powerless, angry, and like we're not worthy of ever getting a job again. It's awful. If you've either been laid off recently or think your position is on the chopping block, read on. This post, my friends, is for you. There are two areas to wrap our arms around: Your headspace and then your life logistics. We'll handle your headspace first so you'll have the mental bandwidth to handle the life logistics stuff after. If you're here because you've been laid off, I want to say one thing: THIS IS AMAZING!! Seriously! Congrat-u-freaking-lations! You've been thrust into the new chapter of your career (and possibly life) and you are going to be making the most of it. I know it. It may be scary right now, but it is also filled with ALL the opportunities for something new and BETTER. So, repeat after me: Your life is so much bigger than your job. It's just a small piece of the pie. Honestly. MEDITATION: Cultivate your headspace by calming it. Meditating is an incredibly powerful tool to do so (if you've never done it before, here's a great book that will get you started). Start out small and build from there. Pro-tip: the chatter in your head doesn't ever truly go away, so don't get discouraged! Stick with it and create a little freedom in your mind. BE OF SERVICE: The other thing you can do is help others, Be of service in some way. We're absolutely surrounded by hundreds of overlapping communities: our town, our city, our friends, our family, our religious/spiritual community, our street, others who have been laid off, etc., etc. What can you do to be in service to them? What help do they need? Be impeccable with your people and your word, and you'll realize soon there is a massive universe out there just begging for you and heaping praise and appreciation into your lap. Go find it. ACCEPT & FORGIVE: If you find yourself in a position where it feels more like a firing than a lay-off, it's easy to be angry and hurt. Give yourself a specific amount of time (a few days to a week) to sit with those feelings without judgement. Binge on Netflix, eat tubs of ice cream, rant, rave, and cry. But once you hit that deadline, that's it: you're committed to moving forward. Think about at least one person who you genuinely liked at your last job, and mentally wish them all the success in the world. And, if you're able to, open that wish up for the entire company, knowing that this person's boat will rise with everyone else's. And, finally, mentally forgive the company itself: you're committing to moving on and being bigger than any one position, and they did you a favor. Now you can be. NEXT STEPS: Once you're feeling up to it, take a moment and think to yourself: do you REALLY want your old job back? I mean, sure, the money was nice (I hope), but do you really want to be doing what you were doing? If you could be finally doing the thing you were dreaming about for years, could this be the opportunity you've needed to jump into it? If a little voice is saying, "yes! ", then do it! Get your research pants on and find out everything you need to about it. Talk to folks who do what you want to do and don't worry about being too forward or having awkward introductions: people WANT to help, even if they don't know you. Will it require you to go back to school or get a certification? Will you need a part-time job while you transition? Figure it out and make a plan! 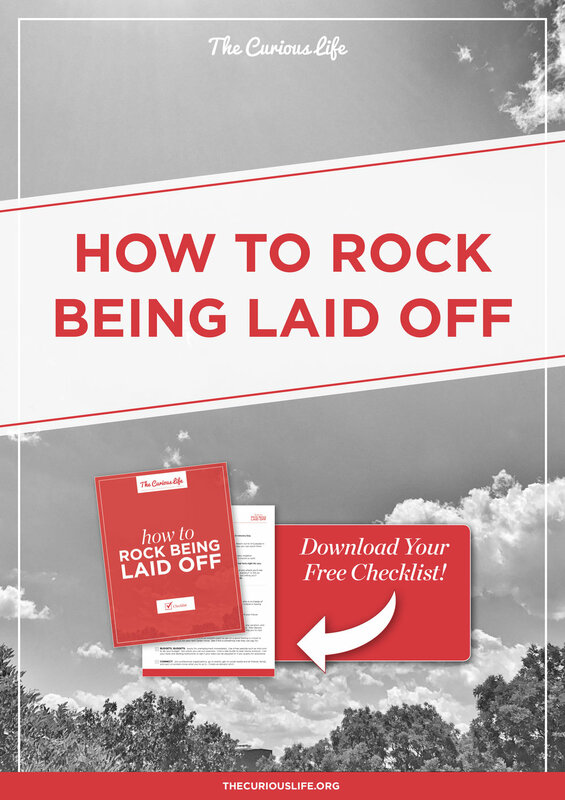 Now that we've gotten the headspace stuff out of the way, let's talk about the nuts and bolts of what you need to do after being laid off. To be honest, there is a bit of headspace stuff here, too (gosh, this stuff can be intense! ), but I promise you'll get through it. KEEP IT TOGETHER: If you've just been laid off or you feel it's imminent, commit to managing your emotions. Don't let them see you sweat, and promise yourself you will be calm, handle the situation with grace, and keep it together. Being explosive or over-emotional may be difficult to avoid (although certainly understandable), but it will not do you any favors and may actually make the situation much worse. You want to come out of this looking like a pro who is in charge of their own life (because, guess what: you really are). It will give you a much more solid base for any necessary conversations you may need to have with your now-former employer. MANAGE THE OPTICS: During or just after "The Conversation," get clear on how the company will refer to your leaving. Will they be referring to it as a lay-off and not a firing? Can a third option be created where you co-create an exit strategy that works for both of you? I've worked with several colleagues where they were able to finish out an additional week to train others who would be picking up the slack, and in exchange it would be framed that they were leaving under their own volition and not a lay-off at all. Others were able to continue to work for the company on a freelance basis, as-needed. If there is trust, understanding, and a good relationship in place, there are a lot of options that could be discussed. (You can see why keeping it together would serve you well in this sort of conversation). LOOSE ENDS & PAPERWORK: Have vacation, sick-leave, stock options, expense reimbursements, sales commission, life insurance, etc.? Will there be a severance package and unemployment benefits available? Be 100% clear on how you will be paid out for all of these as soon as possible. Same goes for your health insurance and COBRA. Find out what you are eligible for and what you're not, and remember that everything is negotiable. Most severance packages include signing paperwork limiting what you can and cannot do in the future (think: non-competes, legal action against your employer, and working with past clients), so don't sign anything until these and any other details are ironed out. If you feel like having a lawyer look it over would be beneficial, don't think twice: do it. WHAT DO YOU NEED? Some employers will pay for a career coach in exchange for being available for any questions that they may have as they transition your former position. Find out if this is available or if they can make it available. Working with an outside coach to get on a good footing is critical to creating momentum for your next career move. BUDGETS, BUDGETS: After the initial conversations, you'll want to immediately apply to receive unemployment benefits. At the same time, sit down and do a budget for yourself. There are great websites such as mint.com that are free, and which will show you how you spend your money and where you can save. Figure out how much money your bills require, how much you'll have left over, and where you can cut expenses. If you have credit card debt or loans, call your bank and explain your situation: they may be able to lower your rates or allow you to sign up for an assistance program for the duration of your unemployment (same goes for your utilities). It's also a great time for that garage sale or finally selling those collectables on e-bay. Speaking of making a bit of cash on the side, if you're able to get a side hustle, it may make all the difference to lessening the financial pressure until you land your next dream job (not to mention getting you out of the house, which certainly can't hurt). CONNECT! Seriously, "networking" is an awful word. I totally get it. Having said that, let's re-frame it as "connecting", which is really all it is. You're human, they're human, and you're shaking hands and seeing where you can create a win-win for each other. Join professional organizations, go to events, get on social media and let friends, family, and past co-workers know what you're up to and what gets you excited these days. See who is connected to who via Facebook or LinkedIn and see if you can organize a coffee or informational meeting to shake hands with who you're dying to meet. The point is, be creative and use every opportunity to connect with people and let them know your story. Speaking of story, have an "elevator pitch" at the ready (this is a 2-3 sentence description of what you do that will cause someone to say, "that's interesting: tell me more!". Here's a great post that goes into more depth on this! Being laid off can be scary, but it can also be INCREDIBLE and the start of something new and powerful for you. Take advantage of the opportunity and you'll be more than fine: you'll be better off than you were before. If you feel like working with a coach could be beneficial (I know I'm biased, but IT TOTALLY IS BENEFICIAL), feel free to schedule a free session with me. We'll outline where you're at and what you can do to get you to the next level. Click Here to Book A Strategy Session. Also, if you haven't already, remember to download your free checklist which outlines all of the above in a single, lovely, well-designed document, just for you. Just click here and it's yours!